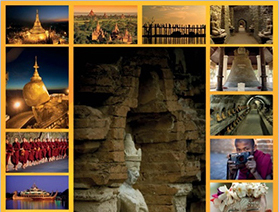 While you are in Mandalay and if you have extra days we suggest you visit Maymyo – day return or overnight. The principal hill station and summer retreat during the British colonial period. It’s an hour and half drive from Mandalay and more than 1000 meters above sea level, and thus has pleasant, cool weather all year round. Popular sights are the colonial style houses with large compounds, National Botanical Gardens and market. Other attractions are the Peik Chin Myaung Caves, waterfalls and Goteik Viaduct.